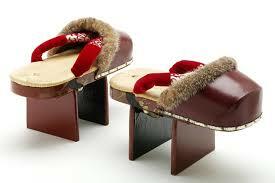 IN THE KNOW WITH RO: WOULD YOU WEAR THESE? 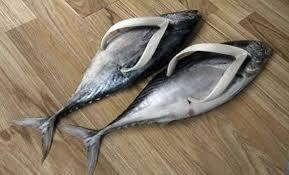 Don't these look like comfy slippers? 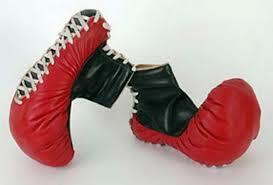 I would try these out! This is what to do with all that leftover Christmas Candy! 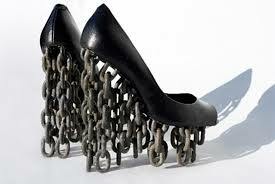 Will they fall apart when walking? Still, very cool! 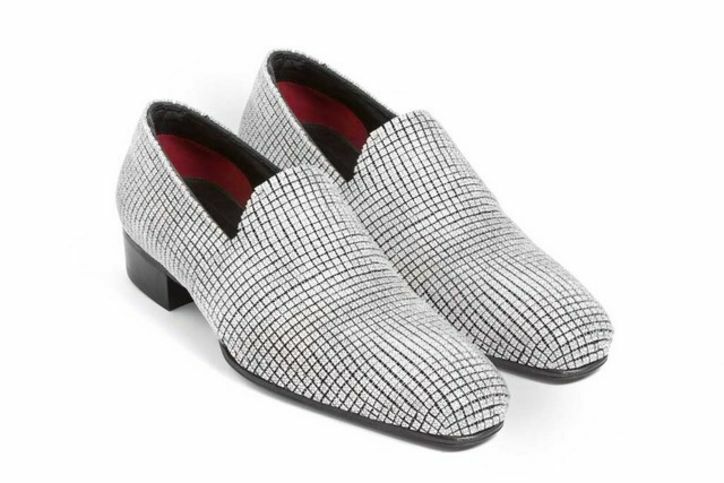 These men's shoes are from Tom Ford and cost $2 Million Dollars! According to the University of California Olive Center in Davis, all Extra Virgin Olive Oils are not created equal, and may not even reach the minimum requirements. The most authentic oils are protected from light in those expensive dark glass bottles or stainless steel containers on grocery store shelves. If you use this healthy oil a lot and want to save money, contact the manufacturer via email or snail mail for high value coupons. You can also do a coupon search online. The White House didn't start off with that name. It's been called The Executive Mansion, The President's Palace, and The President's House. It doesn't look this large when we see it on television, but this massive home is about 55,000 square feet with 132 rooms and 35 bathrooms. 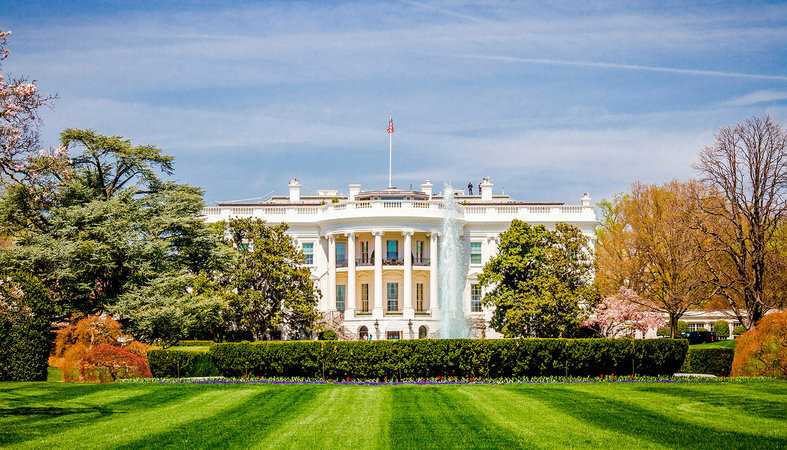 Touring the White House is FREE, but you can't just walk in to say hello. Tours have to be requested through your local congressperson about 90 days in advance and proper ID is needed. Despite the size, tours are only conducted in the public areas within the East Wing. I can't wear heels at all, so I wear my Reebok Princess style tennis shoes. Although Reebok changes the style of their shoes every season, they have kept the Princess since I knew about and started wearing them years and years ago. 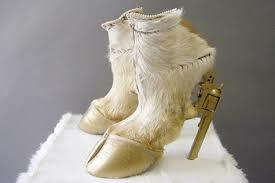 These shows prove that a few designers had too much time on their hands, or they were in a contest to find the weirdest, wildest shoe no sane person would wear. As for regifting, I would gift them back to the person who gave them to me in the first place. My friend Scott and I had a "healthy" discussion about EVOO after he heard a talk that actually referenced the above study. I only buy one brand and it is rated high on their list. I DID buy some cheap Olive Oil the other other day, not even EV. I'm going to make soap and cheap is OK according to the recipe I follow. Goodness. I should learn to proofread BEFORE I publish. That should read SHOES not SHOWS. 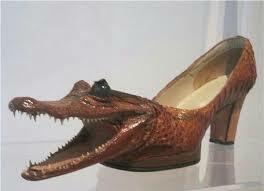 I can think of several funny Halloween costumes to go with those shoes! I agree for sure Angela! Some of these would make great additions to a costume. Goodness, I wouldn't wear any of them! I tend to wear flat shoes these days ... far more comfortable for me. Interesting to read about the olive oil. First are those brussel sprouts? I love them! 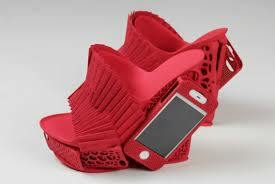 Um as for the shoes..hells no. 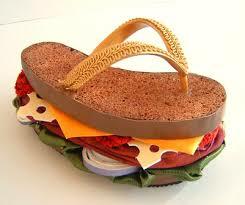 My idea of living large are platform flip-flops!! 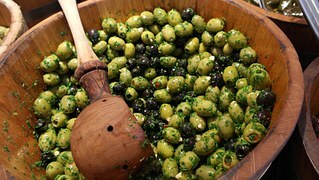 Opened it up on my laptop..those are olives..but ya know what I love them too! Garlic stuffed ones are delicious! 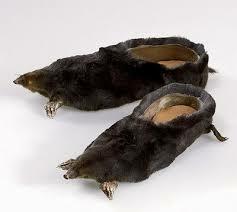 Ya know even though I love rats I would not wear slippers that look like that. I really hope those were real rats that were used. So tacky. 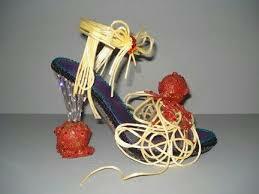 I wouldn't wear any of those shoes, but some of them made me smile or laugh! 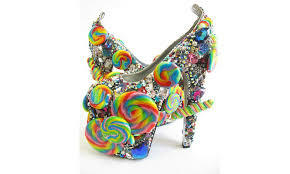 I've seen a pair of ice cream cone shoes that I would wear, though, if only the heels weren't so high. Oh my word. 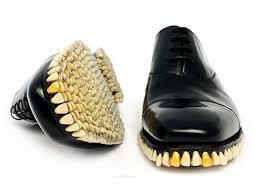 That first pair and the rats totally freaks me out. 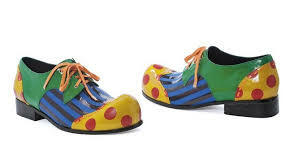 I would wear the same pair you picked (polky dots and stripes:). 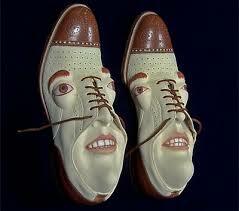 If I tried to wear the second pair I'm sure I'd break my neck without even trying. The wifey ones would be a cute shower gift. Another great post, Rockin Ro. LOL! It makes me super nervous to even look at the ratty shoes Super Sandra! We could be twins with the striped shoes, right? 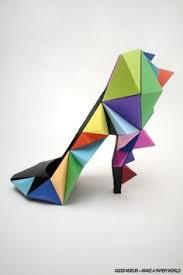 I don't wear heels anymore, but I sure would try a few of these on for about 5 minutes just to shock someone. (lol) Hugs...and Happy Wednesday! I always wanted to tour the white house, but I might have to wait until 2021 to do so. I always imagined I'd be on tour and the president would walk by. I'd probably be asked to leave for telling President Cheeto he is a horrible person. 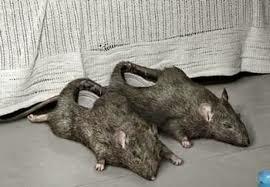 I was just warming to the shoes when I came to the rats – ugh, can you imagine slipping your feet into those in the morning. I bought some (very expensive) Extra-Virgin Olive Oil only this morning, and I’m glad to report its in a heavy dark glass bottle – let's hope it tastes as good as it looks! OMG! 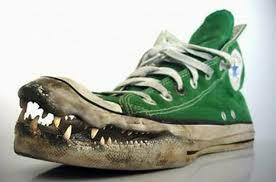 I wouldn't wear these shoes! Interesting about The White House and thanks about letting us know about the extra Virgin Olive Oil. I like the taste. Some of them are pretty crazy, but there are a couple I would throw on for a few minutes or so. I had no clue the White House was so big inside! Hugs and Happy Friday! 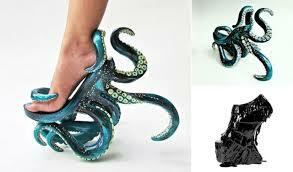 Those octopus heels are amazing! 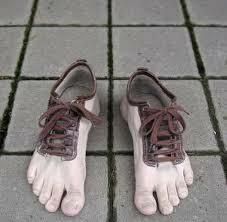 Although, I would need them to be flat because I am not a heel kinda person. 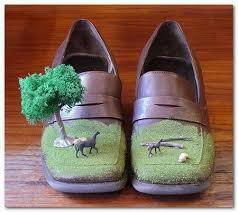 Well, well, now those are some eclectic shoes. 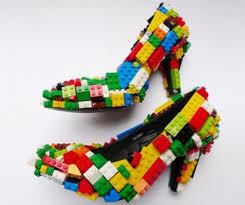 I don't do heels, but could see myself trying the Lego ones for fun. It would be fun to tour The White House someday. Good to know how to arrange for tours. I must confess to not really seeing the shoes as my computer is being temperamental today. So what i can say in regards to wearing shoes is this, i where what i want and like as long as it does not hurt my foot or pinch my toes and of course in my budget. 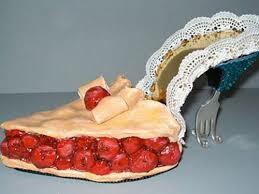 I hope you are able to see the pics now, because some of these are quite creative. I definitely agree on the comfort piece of it. Hugs...RO and Happy Friday! 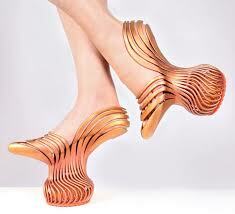 Oh gosh - these shoes are crazy, and it looks like I'd break an ankle in some of these. LOL The lego ones are kind of cool to look at though. Have a day full of sparkle Rockin Ro. 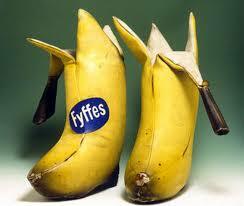 Oh, these shoes were fun. Not my thing since these days I'm strictly a sensible shoes kind of girl but they were fun to look at. heal from broken heart" I wish I could find the right words to say how thankful i am to this love spell caster called Dr.Unity for bringing back my husband after he left me and our 3 kids for another woman.. After 12years of marriage, me and my husband has been into one quarrel or the other until he finally left me and moved to California to be with another woman. I felt my life was over and my kids thought they would never see their father again. i tried to be strong just for the kids but i could not control the pains that torments my heart, my heart was filled with sorrows and pains because i was really in love with my husband. Every day and night i think of him and always wish he could come back to me, I was really worried and i needed help, so i searched for help online and I came across a website that suggested that Dr Unity can help get ex back fast. So, I felt I should give him a try. I contacted him and he told me what to do and i did it then he did a Love spell for me. 28 hours later, my husband really called me and told me that he miss me and the kids so much, So Amazing!! So that was how he came back that same day,with lots of love and joy,and he apologized for his mistake,and for the pain he caused me and the kids. Then from that day,our Marriage was now stronger than how it were before, All thanks to Dr Unity. he is so powerful and i decided to share my story on the internet that Dr.Unity is real and powerful spell caster who i will always pray to live long to help his children in the time of trouble, if you are here and you need love spell to get ex lover back forever or save your marriage fast. Do not cry anymore, contact this powerful spell caster Dr.Unity now. Here’s his contact:Call/WhatsApp: +2348071622464 ,Email: Unityspelltemple@gmail.com ,Website:https://unityspelltempleblog.wordpress.com,your kindness will never be forgotten!.